Play it again, Tiger Woods. For the second straight year, Woods will return from back surgery at his holiday tournament in the Bahamas the week after Thanksgiving. Woods has not played since he withdrew from the Dubai Desert Classic on Feb. 3 with back spasms. Two months later, he had his fourth back surgery in just over two years. Woods will be part of the 18-man field at the Hero World Challenge, which starts Nov. 30 at Albany Golf Club. While sponsor exemptions are limited to the top 50 in the world, Woods is exempt as the tournament host. His latest procedure was a fusion surgery – the previous three were microdiscectomy surgeries – and Woods reported instant relief. He also said just one month ago at the Presidents Cup that he had no idea what his future held. Doctors gave him clearance to practice without limitations about a week later, and Woods had been posting video on Twitter of a full swing with an iron, a driver and then his signature stinger shot with the driver. The tournament has no cut. A year ago, Woods returned after 15 months recovering from two back surgeries. He made 24 birdies, but finished 15th out of 18 players. The tournament is not official on any tour, although it does award world ranking points. He made his first PGA Tour start at Torrey Pines and missed the cut, and then went to Dubai and didn’t make it past the first round before his back began acting up. Woods made the announcement just three days after he pleaded guilty to reckless driving in a deal that allows him to avoid jail time if he doesn’t violate terms of his probation. The deal stems from a Memorial Day arrest on a DUI charge when Woods was found asleep at the wheel of his car, which was still running and parked at an awkward angle about 15 minutes from his home in Florida. Woods attributed it to a bad combination of prescription medicine. 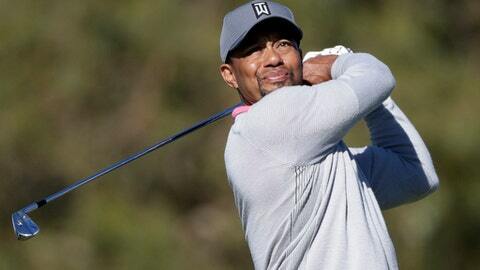 According to a toxicology report, Woods had the active ingredient for marijuana, two painkillers, the sleep drug Ambien and the anti-anxiety drug Xanax in his system. He completed a drug treatment program in July. Woods has 79 PGA Tour victories and 14 majors, both second all-time, though he has not won since the Bridgestone Invitational in August 2013 for his record 18th World Golf Championships title.